It's amazing how many restaurant businesses STILL utilize the antiquated method of using spreadsheets to study key performance metrics and other important details pertaining to their establishments. This approach may have been effective when they were just starting out. Maybe they had 3, 5 or even 10 locations. How would this work with 25 units? 50 units? Can you imagine a franchisor like Panera or Carl's Jr. pouring over spreadsheets ad nauseum? Let's imagine that you have to improve restaurant operations by examining food cost, liquor cost, overtime and study the overall profit and loss across 20 units. How much time would it take to gather the information needed to create an accurate breakdown of these details? Not to mention the time wasted (cutting, pasting, scanning) trying to distribute this information to your team and franchise business partners. And what if errors are made and they go unnoticed until you're well into the thick of it? Do you start over? Are you ready to pull your hair out yet? And what if you wanted to integrate the information from all of your systems? (including POS and BOH systems)? Spreadsheets just can not merge and integrate these details effectively. And the results that they do produce are near impossible to decipher for even the most savvy restauranteur. When you run a large number of units and time is of the essence (not to mention productivity), it's not a wise idea to opt for the solution that will likely render results in weeks. A smarter approach is one that can deliver precise results in hours. For companies that seek detailed and accurate financial and operational clarity, incorporating restaurant management software is the only solution. Decision makers must be able to measure and improve performance. They need to understand and control success across all of their units, zero in on where exactly their inventory is going, why overtime is out of control, how to lower food and beverage costs, and increase productivity and revenue across the board. This is why they got into this business in the first place, right? To make a profit and be successful! So why wouldn't they utilize the best possible practices and tools to help them achieve these exact goals? With the use of the right software, comparing data between units is made that much simpler, allowing for extra time to focus on other important operations and increasing the restaurant profit margin. Bottom line, spreadsheets are way old school. Imagine, if you will, that I wrote this piece using a vintage 1920's typewriter! If you're involved in operations, finance or marketing and would like more information on restaurant reporting, reach out to learn about the solution that will change your business forever! 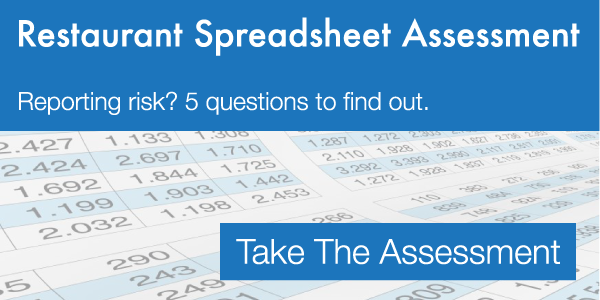 Have you had a negative experience using spreadsheets to manage restaurant performance?